These days, any utterance of the term ‘spoof movie’ would have the receptor sprinting for the closest exit. Films – and I use that term extremely lightly – including, and of similar ilk to, Epic Movie and Meet the Spartans are really just compilations of over-wrought, unfunny and ironic copy-cat segments that would have no place in a bargain bucket, never mind a cinema screen. However it wasn’t always that way. Released over 30 years ago, Airplane! may have unwittingly paved the way for the cackle of uncackles we are now invariably subject to. The only difference being: Airplane! is exceedingly funny, witty and actually pretty smartly written. 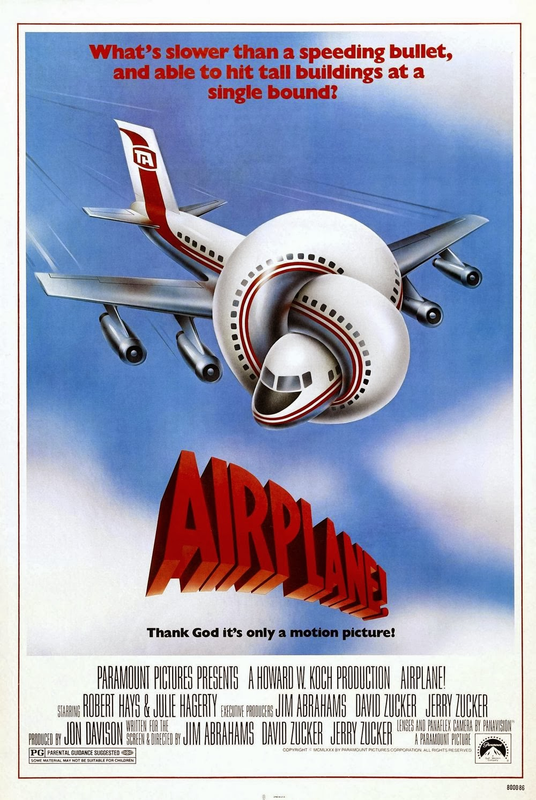 Unable to sufficiently maintain a job after becoming stricken by a fear of flying, former fighter pilot Ted Striker (Robert Hays) now sees his relationship with girlfriend and flight attendant Elaine (Julie Hagerty) crumbling before him. In an act of desperation, Ted reluctantly dashes onto a plane ready for take-off, bidding to conquer his anxieties and secure his romance. Only, Ted’s lofty worries are the least he has to juggle aboard a plane journey where many of the passengers — and all of the pilots — are hit by a nasty bout of food poisoning. Never trust a fish, especially a dead one. Those slippery creatures. From an introduction sprinkled with a dose of pointed aircraft tails swimming amongst the clouds à la Jaws, which certainly isn’t brooding as much as it is comical, Airplane! has you in the palm of its hands. Or the metal of its wings, even. The film is plastered with on-point, unrelenting one-liners that hit you maybe a little more than you’d like, yet somehow an inherent strength to laugh succeeds against aching cheekbones. The quick-fire jokes are a tad corny and rarely over-complicated, yet they always command the viewer’s full attention in order to be entirely understood. In this sense, it’s a bout of hats off to the writers (and directors) Jim Abrahams, David Zucker and Jerry Zucker, who seem to accept and revel in the nature of the spoof-genre without committing comedy homicide — that would entail generic and tedious gags. Even on occasions where the obvious, in-your-face type of musings refrain from divulging organic humour in themselves, it’s the deadpan delivery that breeds and then elevates the comedy (“Smoking or non-smoking?”). As a collective troupe the actors are funny; in particular Leslie Nielsen and Robert Stark bristle with pun-filled laughter by way of their impassive and controlling demeanours respectively. Patrick Kennedy does an exceptional job editing as he allows each of the jokes to soak in all their snappiness, ultimately enabling the film to find an uproarious rhythm in the process. 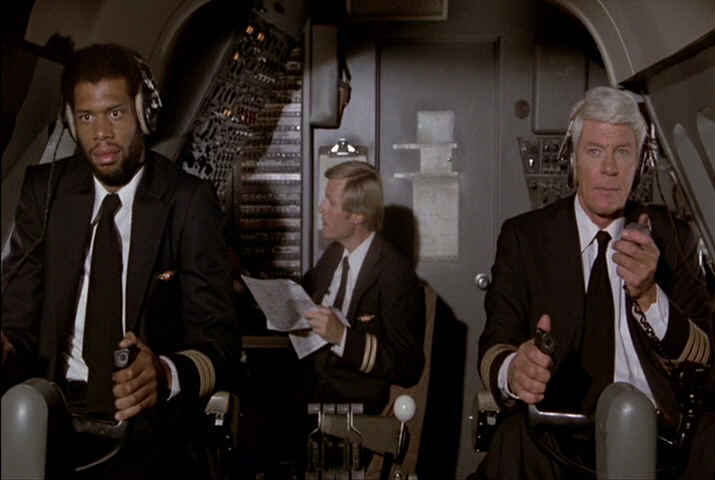 Given the importance of speed and momentum in any laugh generation mechanism, without Kennedy’s editing efforts there’s a good chance Airplane! would enter a tailspin. Although the dreary wisecracks aren’t there, the noticeably familiar characters are on display because they simply have to be in a spoof offering. The nature of parody — and to a degree satirical output — is developing an immediately self-referential atmosphere and, in this case, flying with it. Have your caricature checklist at the ready: we’ve got the popular hostess; an ill but ultra-polite child; the troubled hero trying to win back his partner; two stuck-up kids; the African-American pair with subtitles; an un-oblivious captain; the paranoid wife abroad; an emotionless doctor; the failing basketball star trying to stay out of the limelight; an overworked agent. Sore hand yet? The list goes on, but that’s the point. We hear talkies era music during romantic endeavours, mellow tones as part of war-time recollections. It’s all recognisable and that’s absolutely a slice of the humour cake. Airplane! is expertly constructed, squeezing a bountiful amount of jokes into a relatively short run-time without ever feeling crammed. Part of the traditional hit or miss genre, the film punctures a hole in the proverbial bullseye a great deal more often than it misses. Many an expert of funny would regularly see fit to claim that the key to comedy is perfect timing. Well, this is never late. Looks like I picked the right week to watch a spoof movie. I agree, it is smartly written! “Don’t call me Shirley” – makes me laugh every time! It certainly is! Ha, yes, that is the old classic that gets funnier with age! Pingback: Airplane! Is it Still Funny? | Movies Are Fun! I don’t want to think of the times I’ve quoted that “And don’t call me Shirley”. Such a funny film. It’s brilliant, kicking myself that it took me so long to see it! Ha. The Naked Gun trilogy cracks me up. There’s another few I really need to see!